The above would make a lunch worth, sitting down, with a glass of wine, to enjoy. OK, if you are not a fan of eggplant, maybe this wouldn't work but for the rest of us, this is to enjoy. It is kind of cute with the yellow patty pan, near the top, of the stack. I have come across, recently, a few people who were cooking with patty pan squash and I decided, just for the cute factor, I had to do something with them. I had planned to make eggplant Parmesan for dinner and wanted to figure a way to include my little patty pan friends. My great decision was to use a tomato as a buffer between the eggplant and patty pan and top it with cheese. I was going to use goat cheese but I didn't have enough for all the stacks, so I changed my plan and used mozzarella. I didn't know what to expect and I am happy to say, I was pleased with the results. Not only, is this a luncheon dish, it is a good as a side dish. Heat 1 tablespoon of olive oil in a large skillet. Place 4 slices of eggplant in pan and cook for 2 minutes on both side. Eggplant should brown and get soft. Drain and replace with 4 more pieces until all the pieces are cooked. 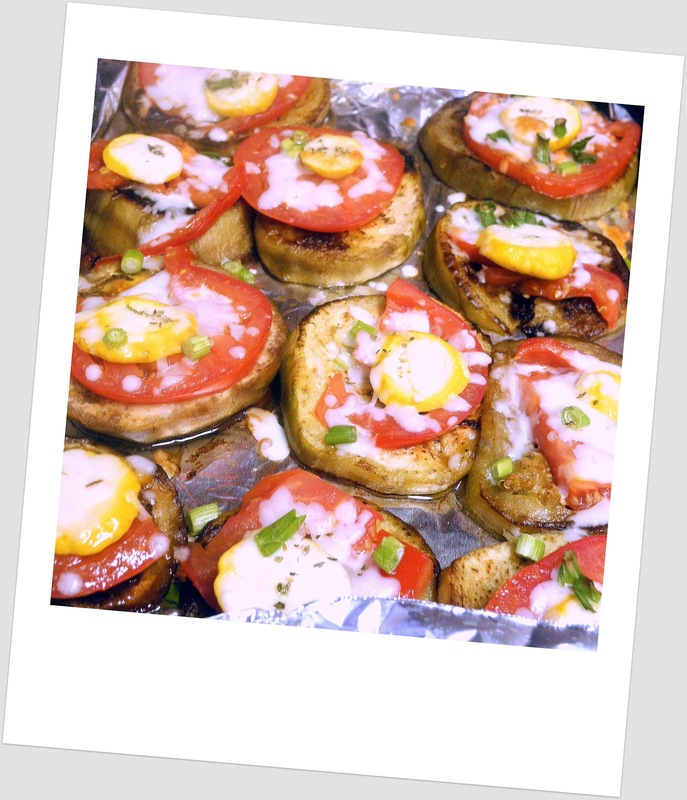 On a cookie sheet on aluminum foil (sprayed), place eggplant pieces very carefully. They fall apart if not lifted with respect. 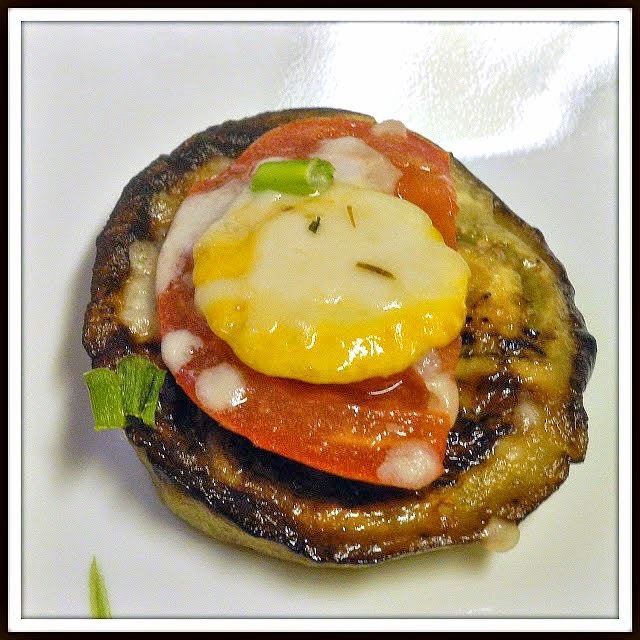 On top of each eggplant slice, place a slice of tomato followed by a slice of patty pan. Bake at 450 degrees for 20 minutes or until cheese is browning and all the vegetables are cooked. I chose not to use spices but feel free to add anything you like. Eat and enjoy. I am really impressed with this wonderful vegetarian and gluten free eggplant dish. It is simple, but genius, You are so right , the patty pan makes it look so cute. Love the colors and the flavors..
YUM! I love me some eggplant and all the other add-ons sound so flipping delicious! I am not versed in eggplant recipes and we love it. Great idea. Pinned. Thanks for sharing this with us on Weekend Bites. This is beautiful, Chaya. My son loves eggplant and I'm always looking for new ways to serve it. I've always wondered how to use patty pan squash - they kind of intimidate me! Love this recipe - it looks beautiful and sounds really delicious, Chaya.